Weather forecasting has been an agelong practice among human race. From the earliest recorded civilization to the modern time, man has always shown profound interest in weather prediction to enable him make an informed decision about his activities. It's not a rocketscience to predict the weather neither do you need to have a supercomputer to try your hand at forecasting. Personally, l doubt if there is anyone who has not attempted forecasting before. 😅Haha...I am not unaware that some people would argue that they haven't but I am going to prove them wrong. You see, like I said above, you don't need supercomputer to try a forecast. And for your information, you may actually have done so in the past without realizing it as most basic form of weather forecasting consists of simple observation. Ever looked up at the clouds and tried to recognize a telltale patterns? Ever looked up at the clouds and wondered if you would need snow boots tomorrow? Or ever taken an umbrella with you as you went out based on your judgement of weather that it might rain? If you have ever done any of the above, then you have actually engaged in weather prediction though unwittingly. From our knowledge of the telltale patterns right from time immemorial, we know that high, wispy clouds usually presage good weather in one hand. In the other hand, an overcast sky indicates impending rainfall or snowfall. And these agelong prediction patterns are true at least most of the time. So man's attempt to know what happens next around him with respect to weather conditions, is as old as man himself. That said, in this two-part series, l would like to review a simple android based application that I have been using to forecast the weather with a fair degree of accuracy for sometime now: Your Local Weather. 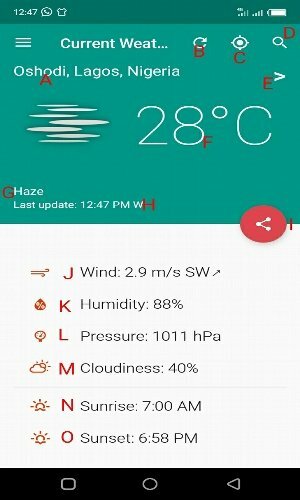 Your Local Weather is an open source android application that displays one's location as well as the weather conditions of the place via making use of cell network, WIFI and GPS. One thing I like about this app is its simplicity, and of course, the fact that it really works. I have had a number of personal experiences with the app that made me believe in its effectiveness at what it does. The app uses data of such atmospheric conditions as the temperature, humidity, wind, pressure and cloudiness to determine quite accurately how the atmosphere would evolve in the future. It uses cell network, Wi-Fi and GPS to get your location and display it on the phone/tablet screen. In addition to all this, the app can predict weather conditions in advance of up to five days. And to cap it all, it presents all this in a very easy to understand manner without the use of high end technical jargons that would have made it impossible for a layman to decode and understand. Anyone can look at the displayed data and have a full grasp of them. It supports multiple languages including English, Russian, Japanese Belarusian, Czech, Spanish, Basque, German, French, Polish and lots of other languages. 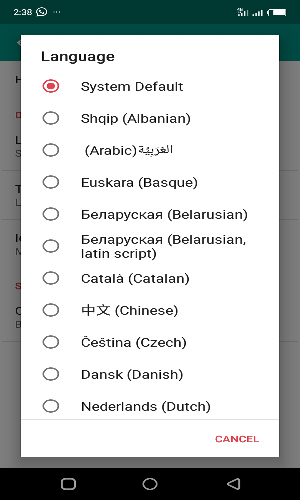 To access this, simply click Menu/Settings/General settings/Language and select language of your choice. Up-front of 5 day weather forecast: as I said earlier on, the app supports weather forecast in advance of up to 5 days. 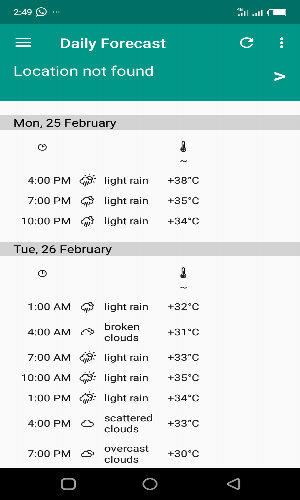 To access this, just click Menu/Daily forecast and scroll down to view the forecast data. 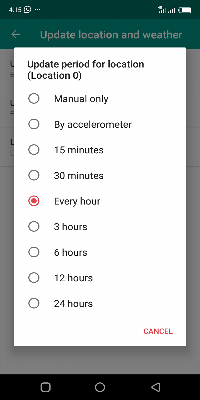 Notifications: to access this, just click Menu/Settings/Notification settings and make your choices of the parameters you wish to be notified about. The app is ad-free: You won't have the experience of annoying ads while using the app. Based on these parameters, the app adjudged the weather to be Haze and truly the weather has been very hazy. It drizzled throughout yesterday until this morning. But then Sunlight seems to make its way through the clouds at about 11:00am, engendering a moderate weather condition described as Haze. In Your Local Weather app, "location and weather features" require continuous updating to meet up with the ever changing human mobility and external abiotic factors. For instance, when you move from location A to location B without updating the app while you are in location B, the app would simply continue to display location A as your current location even though you have since moved to location B.
Conversely, when you travel from location A to location B and fail to update the "weather feature" of the app, it would still simply continue to retain the data it displayed while you are at location A. So, for the app to function in real-time, there is need to continuously update these features to reflect the prevailing realities. Update of location can be by specific period of time (time- based) or via accelerometer. Again you can even switch update of location off, allowing only weather to be updated in this instant. 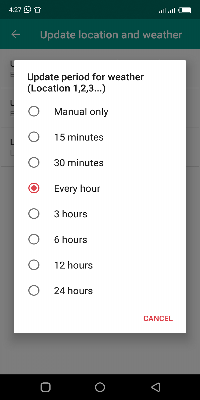 Under specific period of time: there are multiple time options ranging from 15minutes to 24hrs. You can set the app to update your location every 15 minutes, 30 minutes, 1 hour, etc, whatever you choose, once it's the time the app updates itself to reflect your current location. 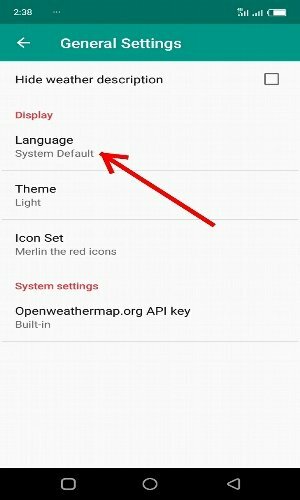 Your Local Weather app employs OpenWeatherMap.org service to get current weather, which can then be updated according to specific time as described above. By this review, it would be appreciated that forecasting has a long history and didn't start in the modern time. Again, the fact that everyone of us may have unwittingly been involved in the act of forecasting, is well buttressed using appropriate self targeted questions that make the fact obvious and undeniable. Although science has birthed a more specialized field called Meteorology, the truth is we are all forecasters having been involved in the act without realising it. In the ancient world, forecasting involved simple observation of weather patterns. But today, however, science has given us a lot of tools with which we can predict weather with accuracy that's far more better than simple observation techniques. One of such tools, and which is my favorite, is the Your Local Weather app which I have taken time to discuss some of its features in this part 1 of this two-part series. In the part two, I will consider bringing other amazing features of the app to the fore. And I deeply believe you would not waste time to reach out for the app and test it yourself by the time I am through with my review. Thank you for this contribution. This is a really interesting blog post, and the same can be said about the project. The post is also very informative and well-illustrated with quality images. On the content side, this was a mixed bag for me. Even though I like all the information provided, I must admit that I wanted to read more about your personal experience of using this tool. Your post certainly contains valuable information about the project and its features, however I wanted to see more editorial content in your review. Your personal opinion is the unique feature you can add to your blog posts. That said, the post did have issues of style and proofreading. Regardless, this was a solid overall effort, and I appreciate the time you took to create this rather informative blog post. I look forward to your next one. I really appreciate your appraisal of this piece. Just as usual, I found it honest. I really have been using this app since April last year, but it skipped my mind to write on my experience of it. Maybe I am going to include this in the part two of this article. Thanks for your candid opinion.